La Mav Nightly Repair Nectar is a heavily rich skin nutrient, providing a cool hydration effect due to cucumber and a healthy glow to a moisture-thirsty skin. At this point in time I am wondering if La Mav could go wrong with any of their products; a while ago I reviewed the best natural BB cream – and it’s La Mav’s and today I’m gonna review their Intense Moisture Nightly Repair Nectar. Such a name suggests quite a promise, doesn’t it. And – does it keep its promise: to provide intense moisture and repair the skin? If you ask me, after using this nectar for nearly a year – I can assure you – it does! 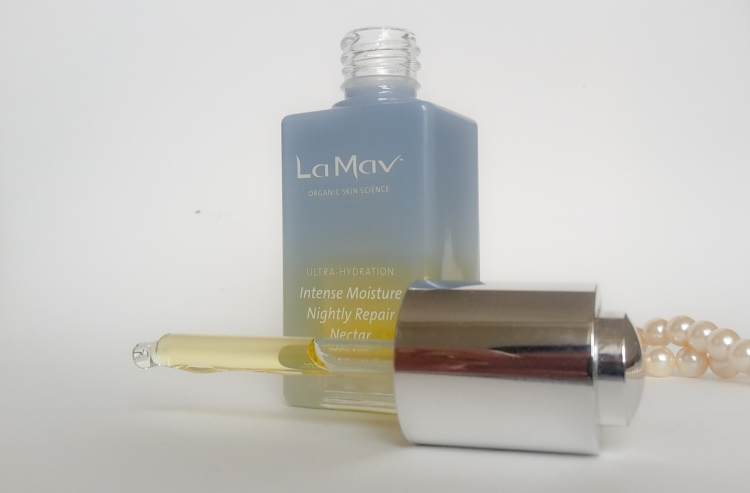 The La Mav Nightly Repair Nectar comes in an elegant 30ml glass blue ombre bottle, with a unique pipette for precise dosage of this rich oil nectar. 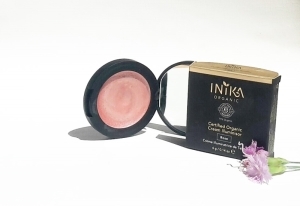 The scent itself of this nectar is worth giving it a try on its own: a soothing to senses refreshing cucumber scent with a slight hint of roses. The texture of La Mav Nightly Repair Nectar is rich and thick, given it contains some rich and heavy moisturizing and nourishing oils, combined with calming chamomile and super hydrating cucumber. I keep, among many other natural beauty products, the La Mav Nightly Repair Nectar in the fridge – not only in order to remain as fresh as possible, but also to draw the cucumber effect out as much as possible. While this nectar is suitable for all skin types, especially for those whose skin is very dehydrated – and having dry skin is not the same as having dehydrated skin, so even if your skin is oily, it can be dehydrated; in fact, over-production of skin’s oils can be a sign of dehydration – those, who have dry skin, can use this nectar during the day, while those, whose skin is oily, like myself – I use this nectar during the night. It is a thick and rich facial oil, targeting the skin’s repair during the night. I use it after a facial toner/hydrolate. A little of this nectar truly goes a long way. Its absorption is not immediate, but at the same time it doesn’t take very long. The scent lingers on for a few hours – and it’s a treat for senses. What can I tell you as far as performance goes after using the La Mav Nightly Repair Nectar for nearly a year? The nectar provides the skin with immense hydration. Various stresses in our lives tend to have an effect on the skin as well – leaving it dull – and this nectar addresses such issues as well, giving the skin radiance and glow – like the skin is rested and received much needed nourishment boost with Argan and Marula oils. Bisabolol and Chamomile provide calming effect to the skin – making this nectar a great choice for sensitive and irritated skin. And the cucumber is the hydration star ingredient. 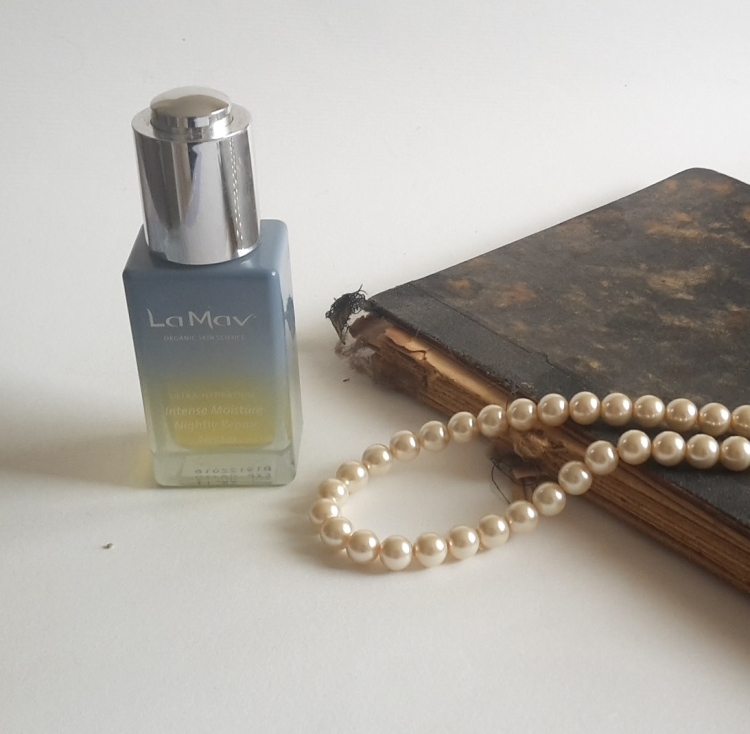 During Summer, I used this nectar only a few days a week – very small amount of it, in order for my skin to remain on a radiant path, while during Winter, I use the La Mav Nightly Repair Nectar far more often. And given its scent and effect it has on the skin, it’s easy to go a little bit overboard with the amount of the nectar – but really, the best approach is to use only half of the amount of the nectar that the pipette upon pressing it contains. So how about the ingredients? Ingredients: *Macadamia Integrifolia (Macadamia) Seed Oil, *Prunus Amygdalus Dulcis (Sweet Almond) Oil, *Persea Gratissima (Avocado) Oil, *Simmondsia Chinensis (Jojoba) Seed Oil, *Sclerocarya Birrea (Marula) Seed Oil, *Argania Spinosa (Argan) Kernel Oil, Euterpe Oleracea (Acai) Fruit Oil, Cucumis Sativus (Cucumber) Oil , *Rubus Idaeus (Raspberry) Seed Oil, Tocopherol, Bisabolol, Glycine Soja (Soyabean) Oil, Rosmarinus Officinalis (Rosemary) Leaf Extract, *Chamomilla Recutita (Matricaria) Flower Oil, Rosa Damascena (Rose) Flower Oil. Macadamia Seed Oil is a rich and skin-identical ingredient due to high palmitoleic acid (found in the sebum of human skin). It softens the skin and works as an anti-irritant. Sweet Almond Oil has antioxidant and anti-inflammatory properties. It is rich in essential fatty acids (especially linoleic acid) and Vitamin E. Great for sensitive skin. Avocado Oil is rich in vitamins (A, B1, B2, C, D, E, and Beta Carotene) and fatty acids; an emollient, which revitalizes the skin. Avocado Oil contains high content of vitamins; it regenerates and moisturizes skin. Jojoba Oil an emollient, natural to skin’s sebum, it soothes the skin and promotes collagen production. Marula Seed Oil has a high content of antioxidants, minerals and fatty acids; it hydrates and repairs the skin. Argan Kernel Oil has anti-inflammatory properties; it contains high content of fatty acids and antioxidants. It softens the skin and is an excellent anti-aging agent. Acai Oil, an emollient, is a potent antioxidant; its fatty acids promote a tighter skin. Cucumber Fruit Extract has astringent properties. 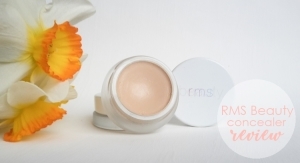 It’s very hydrating, cooling and soothing and works well against skin’s puffiness. Raspberry Seed Oil is a potent antioxidant, with a high content of fatty acids and with antibacterial and anti-acne properties. Bisabolol reduces dry flaking and restoring suppleness to the skin; it has anti-irritant, anti-inflammatory and anti-microbial properties. It stimulates and promotes the skin’s healing process due to its high panthenol concentration. Rosemary Extract, an antioxidant, promotes and improves circulation and stimulates cells renewal. It has antimicrobial properties and is great for oily, acne and blemishes prone skin. Chamomile Flower Extract moisturises, softens and purifies skin; it has anti-inflammatory, anti-irritant, calming and regenerating properties. Chamomile oil has antioxidant, anti-inflammatory, antiseptic and astringent properties; it calms the skin. Rich and thick facial oil, the La Mav Nightly Repair Nectar is full of skin-beneficial ingredients – antioxidants, vitamins, ingredients with calming and anti-irritating properties, along with hydration boosters. A minimal amount of this precious nectar is needed in order to achieve a hydrated, radiant and calm skin; the lovely scent, especially that of a cucumber, is just a cherry on the top of this great skin care product. After nearly a year of using La Mav Nightly Repair Nectar, I can report of no side effects, no irritation, only nourished and hydrated skin – rested and calmed skin. There are two more nectars available from La Mav’s nectar line, both firmly on my wish list: the Vit-C Advanced Nightly Repair Nectar and the Antioxidant Rich Nightly Repair Nectar, whose both ingredients are making my skin itch, in a good way, to give them a try. Price? 60 AUD (which is approximately €38) for a 30ml of an excellent facial oil, and these 30ml can be stretched over a year, easily. Reasonably priced, if you ask me. 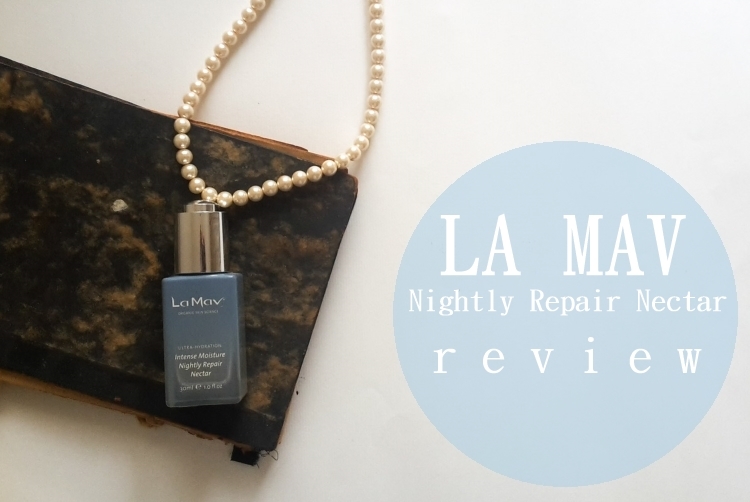 The La Mav Nightly Repair Nectar is one of those products I wish to have on my cosmetic shelf at all times; given its generous amount and the fact that, if I speak of La Mav here only, I have the other two La Mav’s nectars on my wish list, I don’t know how to go about this, without getting close to hoarding green beauty products, and that is not something I tend to do – but nonetheless – no matter how many other green beauty products I’ll try, I am certain I will eventually return to this one. Have you tried any of the La Mav’s nectars? Which one is your favorite? Let me know! For more information on La Mav, please visit their dedicated brand page. La Mav Nightly Repair Nectar has been provided to Nature of Europe for the purpose of an honest review.